It’s almost that time of year again. The time of year that Santa delivers gifts via the chimney, apparently, and also when Apple give away a selection of products from their iTunes store. Regular visitors to Sunshine Playroom may remember me posting about last year’s offer, which offered a wide selection of goodies, some better than others of course. This year people will be hoping that Apple can deliver up a good mix of games, videos, and songs as they have done in previous years, whilst those among us who have become iPad owners this year will be hoping that they aren’t forgotten about either. For those of you unfamiliar with the previous offers, Apple will be offering a freebie item every day for twelve days, from December 26th to January 6th. To find out more about these, or to make sure you don’t miss out on any offers, you can sign up for e-mail notifications. 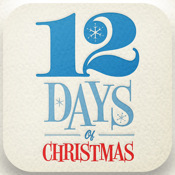 For those people with iPhones, iPads or iPod Touch devices, a more preferable way to keep up with them is probably to download the free ’12 Days Of Christmas’ app from the iTunes store, which will notify you each day (via ‘push’ notifications), and provide you with a direct link to the store to download if you so wish. To get some idea about what gifts you might expect to get this year, I’ve posted a list of last year’s giveaways further down the page, but for those of us who have already signed up for this year, we got an added treat earlier today when iTunes gave away a bonus item, a three track EP from Kylie Minogue called A Christmas Gift, unsurprisingly. It features two tracks from her recent Aphrodite album, along with the festively appropriate Santa Baby. A nice little treat really, as it’s in addition to the twelve gifts to come later. I shall endeavour to update this page each day to include this year’s gifts as they appear, so it may be worth heading back here over the festive season to keep track on the offers. This entry was posted on Friday, December 17th, 2010 at 1:57 pm	and is filed under News, Technology. You can follow any responses to this entry through the RSS 2.0 feed. You can leave a response, or trackback from your own site.